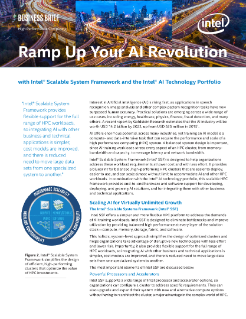 Upgrade your HPC platform and clusters and join the AI and HPC revolution with Intel® Scalable System Framework and the Intel® AI Technology Portfolio. AI offers enormous potential across many industries, yet training an AI model is a compute- and data-intensive task that can require the performance and scale of a high performance computing (HPC) system. A balanced system design is important, ...since AI training workloads stress every aspect of an HPC cluster, from memory-bandwidth and capacity, to message latency and network bandwidth. Intel® Scalable System Framework (Intel® SSF) is designed to help organizations address these workload requirements at lower cost and with less effort. It provides a blueprint for balanced, high-performing HPC clusters that are easier to deploy, easier to use, and can scale almost without limit to accommodate AI and other HPC workloads. In combination with the Intel® AI technology portfolio, this scalable HPC framework provides end-to-end hardware and software support for developing, deploying, and growing AI solutions, and for integrating them with other business and technical applications. The next wave of AI innovation will require simpler development tools and enormous new computing capability. Intel® SSF and the Intel® AI technology portfolio provide comprehensive support and a unified platform to help organizations of every size develop and scale AI applications. As innovation heats up, the advantages will grow. Intel is working with academic, open source, and industry leaders to extend AI solutions and usage models. These and many other advances will ultimately be reflected in the Intel® AI technology portfolio and will help to provide an increasingly powerful and flexible platform for AI. Meanwhile, Intel® SSF will help AI innovators scale their neural networks and other back-end solutions more affordably and on a flexible hardware architecture that can efficiently support the widest range of business and technical workloads. These foundational resources will help organizations ride the wave of escalating performance and functionality, so they can focus on driving deeper and more useful intelligence into everything they do.